2.5 quart, food-grade stainless steel bucket. Free of chemicals, BPA and latex. Detachable handle and graduated measurement markings. Easy to assemble, use and clean. 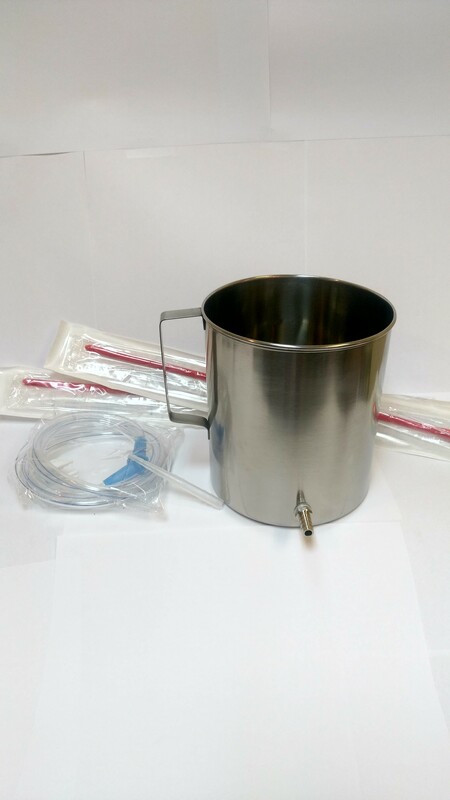 Kit includes: 1 Stainless Steel Enema Bucket, 1 connector to connect tubing to catheter, 1 Clamp, Tubing that is 6 feet long and 2 Catheters of your choice of Red Rubber or Silicone BPA free catheters for those with latex allergy. Sizes available in red rubber: 16 fr (5.3 mm or .21 inch diameter), 18 fr (6 mm or .24 inch diameter), 20 fr MOST COMMON (6.7 mm or .26 inch diameter), 22 fr (used for castor oil) (7.3 mm or .29 inch diameter). Sizes available in silicone: 12 fr (4 mm or .16 inch diameter), 16 fr (5.3 mm or .21 inch diameter), 18 fr (6 mm or .24 inch diameter). Enema Kit #1 includes: 1 (one) Enema Stainless Steel Bucket , 6 foot length of tubing, 1 (one) connector to connect tubing to catheter, 1 (one) clamp, and 2 (two) Catheters of your choice. Catheter sizes available in red rubber 16, 18, 20, 22. Catheter sizes available in silicone are 12, 16, 18.